After a long thirteen months, the protest finally ended with the U.S. Supreme Court stated that the segregation was not constitutional and over-ruled it. Martin Luther King Jr. became an international leader for the Montgomery boycott. 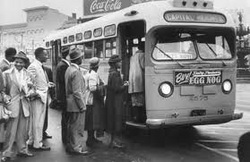 The bus boycott showed a way of protesting in a nonviolent way. This was a very great way for African Americans in the southern part in the U.S. to have a say. All whites had to get used to the idea of "First come, First serve." All buses had to make a change or they would go out of business. Funny to think a group of people could change history tremendously!